Back to "All about languages"
Take advantage of our multilingual feature and push your Voog site to the next level. 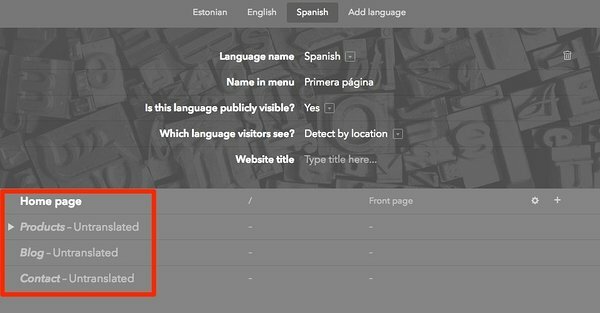 Click on the +Add link next to your sites language menu. First, choose a preferred language in the Language name drop-down menu and then type in the name you'd like it to appear in the language menu to the Name in menu field. In case you'd like the web browser to detect the users language preference by location, choose Detect by location from the Which language visitors see? field. Alternatively you may also select this language as a default for all of the visitors. Region setting will help you display the country's flag preference on your website. P.S! Region setting avaliability depends on standard design you have chosen. 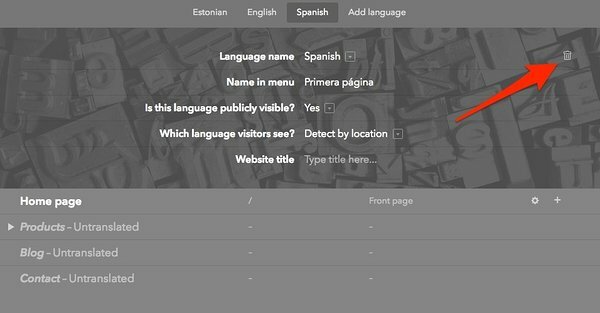 The second way to build a new version of your site in a different language is by going to Content > Structure menu and choosing Add language by the header of the menu. Then, again choose a preferred language, give it a menu name, set the language detection on or off and lastly, add a website title in this new language. There are two ways to translate a page. You can see all of your untranslated pages in your sites main menu as "greyed out". Click on the Untranslated page name to open up a Add a new page menu that will ask you to type in the page title. You can also change its address if necessary and pick the preferred layout. 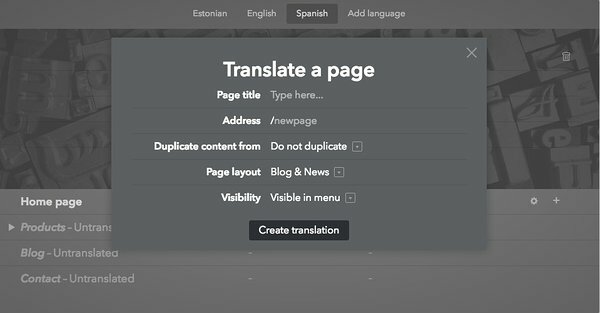 The alternative way to translate a page into new language is to go to Content > Structure and by choosing the language you want to translate into from the upcoming menu. 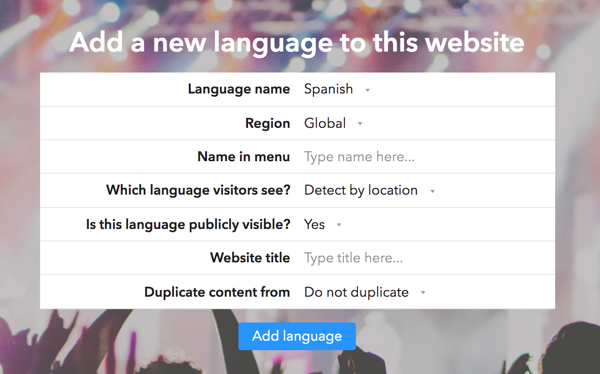 Choose your preferred language from the top panel and expand the list to see all the pages on your new site. You'll see the Untranslated note next to each page that hasn't yet been translated. Once you click on it, you'll be directed to the Add a new page menu where you'll have to give the page a title, manage its URL and select a layout. If you'd like to delete an existing language from your Voog website, go to Content > Structure, select the preferred language that you'd like to delete from the header menu and then click on the garbage bin icon behind the Language name field. When clicked, a window will pop up to ask for your confirmation. You can confirm it by selecting OK or not proceed by selecting Cancel. NB! Deleting a language environment also deletes ALL content and pages in this language. Remember that there has to be at least one language left to make sure that your site is accessible for others.